The SkeeterVac SV5100 Mosquito Eliminator Trap is the ultimate weapon in the annual battle against mosquitoes, black flies, no-see-ums, biting midges, and other blood-seeking insects. This mosquito trap uses every trick in the book to provide your family and your home's yard protection against potentially dangerous pests. The SkeeterVac SV5100 employs a combination of CO2 converted from propane (CO2 attracts these insects), Octenol BaitBlock attractant, Flight Guide contrast attractor pattern, LED motion lights, a TacTrap sticky trap, and suction power to draw insects in. All of these elements give you over an acre of protection from flying insects. The SkeeterVac is powered by propane and needs no electrical source, it is designed to operate 24 hours a day and increase protection over time, and runs quietly and smoothly enough not to disturb any of your outdoor activities. Simple ignition, hands-off operation, and deadly effectiveness make this mosquito trap a cut above the rest. 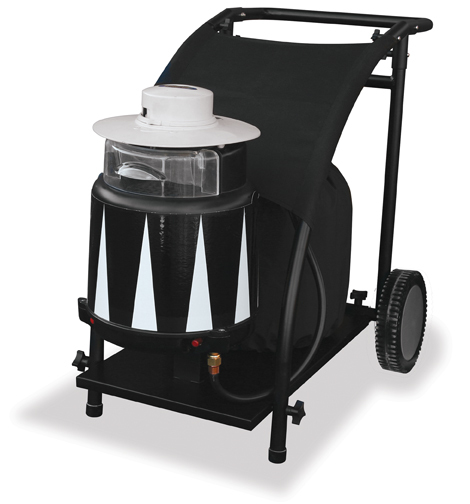 If you and your family are tired of being chased indoors or simply want to use your yard again without worrying about annoying and dangerous pests, get the SkeeterVac SV5100 Mosquito Eliminator Trap by UniFlame running in your backyard today to stake your claim on the outdoors before the bugs do. Is this mosquito trap waterproof? Can it work safely if it is left outdoors and caught in the rain or sprinklers? Also, how far away from my pool patio should it be placed? Do you recommend having this trap running all the time? The SkeeterVac 5100 is to be used outdoors only and cannot be covered by a roof or overhang. You should place the trap at least 10 feet away from your living areas. To get the best extermination performance, the trap should operate continuously. Do we open the white paper on the top of the biting insect lure? You will need to open the entire package, exposing the lure completely. How long will this unit run on one LP tank? The LP tanks will last approximately 15 - 21 days. How long does a bottle of propane last (how many hrs. per bottle)? How many hrs. acquired out of consumables? Need to estimate cost to run for summer months, in Eastern shore of Maryland. The consumption rate is variable according to how you adjust the flow rate. A safe estimate for a 20 lb tank during high volume mosquito season for a unit being used often is approx 1 tank every month. This is our 4th year with 2 of these fantastic contraptions, one at each of our houses. I cannot tell how awesome it is now hanging out on the patio with NO mosquitoes, and NO bug spray. In fact, we're offended when we see just ONE mosquito (the nerve!). You will not be disappointed in this machine. ProsStarts working quickly each year - 90% mosquito problem gone in 2 wks. Works fine with just 1/4 turn on the propane tank valve. Easy to move around (you don't need the cart). ConsThe sticky paper is hard to attach till you get the hang of it. The unit works well, though it did not work at all when it arrived. The company was easy to deal with and it turns out that the whole unit needed to be replaced. When the new unit showed up about a week later they sent a used one that is 2 years old (there is a manufacture date on it), the plastic was sun faded and two of the three screws that hold it together were stripped out and laying in the bottom of the box. So, needless to say I was kind of disappointed, although it does work. So I set it up and it has been going for about a month. In the first couple of days it caught a lot of bugs, since then it has only caught a few, but there is significantly less mosquitoes in the yard. We donâ€™t notice the difference until we go to a friendâ€™s house then we can appreciate it. Overall I would purchase this product again.